How is it 10 years already! It all began with a Christmas present that Louisa gave me, a Henle edition of the Cesar Franck Sonata, back in 2006. 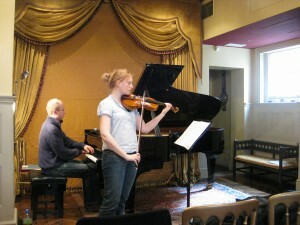 I had played the work a few times already (but only with a cellist) and I was very keen to play it with Louisa. 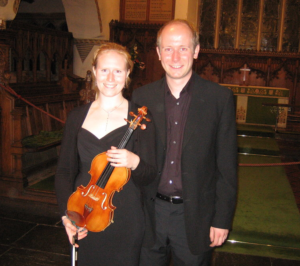 So, after a few months preparing, that’s what we performed in a church in Surrey on April 27, 2007 and the Steinberg Duo was born. Now that I think about it, it’s a little strange that we gave our duo a name at all, but I suppose it was subconsciously a statement of intent. 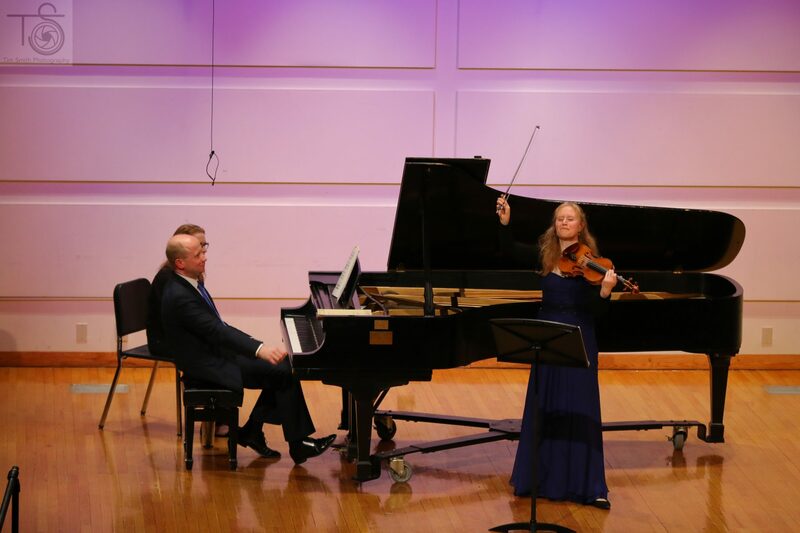 Right from the beginning we wanted to present the violin sonata repertoire as chamber music, presenting ourselves on stage as an ensemble, not two individuals or worse, a soloist and accompanist (I HATE that label!). Little did we know at the time that our duo would quickly become the primary focus of our professional lives, leading to hundreds of performances, four recordings, radio broadcasts, exciting travel, huge highs, devastating lows, many, many, many hours of rehearsal, but above all, an incredible journey with awe-inspiring music. Well, concert-day remains a mystery, sometimes we feel like anything is possible on stage, while other days just feel… uncomfortable. We have developed little rituals for before a performance to try and mitigate this, Louisa always has to try on many different concert dresses the night before… and sometimes even more in the morning before she finds exactly the right outfit for a particular occasion. 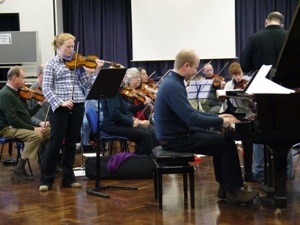 When we arrive at a venue we usually have a fairly intensive rehearsal to fully explore the possibilities of the piano and the hall. Bananas… they’re essential! We like to have quiet time immediately before we go on stage but also a good amount of time to properly warm up. The Hall itself has to be warm enough, playing cold is NOT fun! Oh, and of course we have to had enough time beforehand to properly prepare each programme. Despite our best efforts to nail down a foolproof routine, every performance still feels different, and that is what makes live music so exciting! We never stop learning, or pushing each other, or finding more in the score. Pieces that we have played the most reveal ever more possibilities the more we return to them. Also coming back to a piece after a few years is like entering a time warp. Invariably our first rehearsal on a piece after a break feels like the last performance was just the night before, it’s the strangest sensation. It is just amazing how the brain can retain so much over such a long period. Page-Turners have the hardest job in the world! I have had some DISASTERS over the years – one went totally on strike in the middle of the 2nd movement of the Franck after always turning in the wrong place (pianists will feel my pain), one I’m fairly certain was totally deaf and kept getting lost, another wore a huge double-breasted jacket that pretty much covered my hands every time he turned, worst of all was the one who wrestled with me and the music, eventually tearing the page in half during a particularly fiendish passage of Rubinstein! Even when all goes well, the best page-turners have been those that I was never conscious of on stage. How can you ask someone to telepathically turn at exactly the right moment while remaining completely invisible and subtle? I don’t envy them! I’m pretty sure I will convert to an iPad and foot-pedal soon! In every audience there is invariably someone hearing these pieces, and sometimes even classical music, for the very first time. We are always conscious that no matter how familiar the repertoire is for us, we have to make sure it makes perfect sense to someone who has never experienced it before. If you can’t captivate the newcomer in their first experience then you might have lost them forever. We love it when that person comes up to us at the end of a concert to say they are totally hooked. There’s nothing quite like the look that an audience member gives you after a concert if you have moved them deeply. Equally it is absolutely magic when you can make a large group of people sit absolutely still in deafening silence. That’s when you know everyone in the room is really listening to every nuance. Recordings push our playing to new heights and are the most incredible challenge. To perform with absolute intensity and consistency, at the very limit of a piece’s expressive possibilities is thrilling and totally exhausting all at the same time. We’ve been pretty happy with the end results but still when we come back to the repertoire we’ve recorded there is always more to be found! 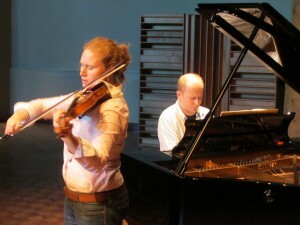 Lastly, I remain perennially jealous of string players! They have such expressive control over long notes. They can bend time, gravity and even space all by just a subtle tonal nuance. We pianists just have to use our imagination and create the illusion of what might happen to a note when in reality every piano note immediately dies away! 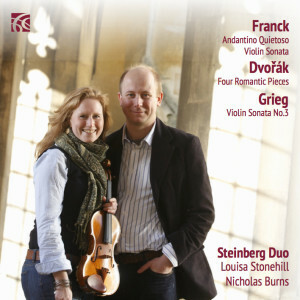 Maybe one day I will get my violin out again and start practising but in the mean time I will continue to enjoy listening to Louisa’s musical ideas. And the best thing about reaching this 10 year landmark? It really does feel like we are just getting started! Watch this space, you ain’t seen nothing yet! I’m really happy for you! Just carry on with what you are doing. In no time you will look back again. Time is an interesting concept!